Home › Math › I gave the keynote address… and lived to tell the tale! I gave the keynote address… and lived to tell the tale! Who won the 2016 Presidential election? In a democratic election, what do we do when no one has a majority? First Past the Post vs. alternatives. What system did Boston pick? What are its political consequences? What system did Cambridge pick? What are its political consequences? American Exceptionalism: The Electoral College. 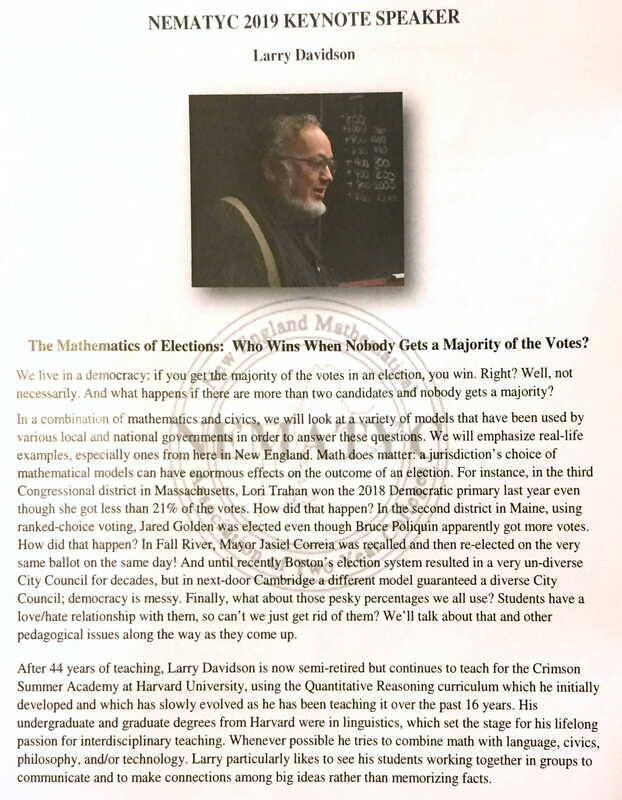 Even though I’ve been teaching this material primarily to high-school students, it was a good fit for math professors at two-year colleges, since their first-year students aren’t particularly different from the younger ones whom I have taught. And I was able to make good use of the fact that the venue happened to be Quincy College, which occupies a couple of floors in the large warren called Presidents Place in Quincy: the name of the building comes from the fact that two of our presidents — John Adams and John Quincy Adams — came from the city of Quincy. This was apt, since my classic example of the Electoral College is the election of 1824, where Andrew Jackson got a plurality of the popular votes (irrelevant) and of the electoral votes (relevant), but nobody had a majority, so the House of Representatives elected John Quincy Adams as president. Along with this straightforward American history — genuine, but boring to many students — I included in my talk some material that both this audience and my teenaged students appreciated, such as our Crimson Summer Academy simulated election of the Supreme Musical Artists of the Past Fifty Years and a great video about Ranked Choice Voting, which uses English cats instead of political candidates to explain what that is all about. In that connection we also looked at several U.S. elections where Ranked Choice voting either would have made a difference (if Massachusetts had it) and where it did make a difference (since Maine does have it).